I sounded like a broken record telling you guys how much restaurants and food parks are popping around Marikina. As I am nearby the city, I've been a lot of these dining destinations. 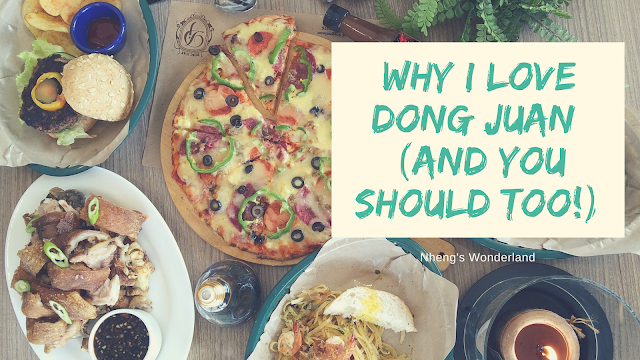 Recently, I discovered a new family-oriented casual dining restaurant which is named Dong Juan. Dong Juan was developed with Cebu Market in mind and established in 2017. From its humble beginning of its first branch located in Guadalupe, Cebu City, it had branched out and established a foothold on major key cities in the country - Manila, Cebu, Dumaguete, Iloilo, Cagayan de Oro and Davao. Latest branch just opened last October 6, 2017, at the newest food haven in Marikina City. I happened to be invited to try Dong Juan at Lamp Quarters Marikina with my fellow Zomato foodies. Upon knowing that it's on the newest beautiful food park in the town of Marikina, I obliged right away. I am happy up to this day that I did! Waking up early to go there was super worth it. And so on this post, let me tell you why you should love Dong Juan (and you should too!). First, on my reasons, I love Dong Juan because it's rightfully located on a food park that complements its theme. When you enter the restaurant, the sweet and homey ambiance will await you. I love how the positive quotes were hanging on the wall. I love how well lit the place is. They also accessorize the ceilings with lamps as they are at Lamp Quarters anyway. Second on my list is the food! Well, this my favorite part! Who wouldn't? Dong Juan is very proud of the menu it has developed where quality and quantity can be merged together. But they will always choose the latter to come first. Need I say more, let's get going with the food. We were first served with coffee. Those cute lightbulbs are condiments containers. Kalamansi Blush - P99. The freshest drink with a twist as its infused with Strawberry and Kalamansi extract. Crush the strawberries for better taste! One of my fave is this Gambas Al Ajillo Pasta - P259. As bonito flakes sprinkled on top, you may want to grab a spoon and taste how this is cooked just right. Definitely a must-try pasta! Dong Juan Burger - P179. The burger that started it all! Classic and flavourful. Dong Juan Ultimate Bacon Burger - P269. Naturally smoked thick-cut bacon on top of bacon makes an epic meal. Eat their burger while it's hot to see how juicy it is! Third on the why's is the way they cook this Asian Style Crispy Pork Knuckles - 489, and their pizza's from their very own designed brick oven. It uses charcoal kindle that helps makes the food comes out its real taste. And I can attest to it! The crispy pata was so damn good that I can't help myself eating a lot of it! Think I'm done on listing the reasons on why I love Dong Juan? We haven't been to the dessert yet! They got the best freaking mug cake ever! I was able to try their Mug Cake Salted Caramel and I forgot my name in an instant! One mug costs P199. I'll be back for this! Other desserts are available such as this Ice Cream Burger - P229. In between oatmeal cookies are two scoops of ice cream with Belgian chocolate chips. Having listed on why I love Dong Juan, maybe something in your heart makes you want to visit them. C'mon, you can thank me later! Dong Juan will definitely be a place for people who would like to come and meet in order to relax and enjoy good food right away from the busy bustle of metropolitan living but still convenient enough to go and to have a good time with friends and family.